Following my abstract, “Physicians Consider Four Aspects of Churchill’s Health” (March 2018), Doctors Scadding and Vale extend their survey of Churchill’s health through 1953. The format of their earlier articles continues. They present the evidence (mainly from diaries and memoirs), offer a chronology based on the official biography, quote press reports, and extensively discuss causal factors. Since technical language is minimal, their articles are readable by non-physicians. The main text is accompanied by vignettes on the protagonists. In July 1949, Churchill and his entourage traveled to Italy, first to Lombardy, where he was troubled by heat and humidity. He moved to the Dolomites, departing on 10 August for Strasbourg. There he led the British Opposition delegation at the inaugural session of the Council of Europe. From 12 to 17 August, Churchill had a busy schedule of meetings and speeches. On the 18th he left for a writing and painting holiday at Lord Beaverbrook’s villa, “La Capponcina,” near Monte Carlo. In the small hours of the 24th, playing cards with Beaverbrook and others, Churchill felt unwell and complained of cramp in his right hand. When he awoke at 7, the cramp was still there and Beaverbrook called Dr. Gibson, a nearby British physician. Lord Moran, also notified, flew to the Riviera, taking his golf clubs to fool the press. Moran’s account is from his published diaries, The Struggle for Survival (1966). Reporters were told that Churchill had a “chill” to suppress speculation over something more serious. His quick recovery and successive public appearances supported this. On 31 August he returned home to resume political activities, and to watch his racehorse at Epsom. By the end of December Churchill was strong enough to fly to Madeira for another writing and painting holiday. But announcement of a general election in February caused him to fly back on 12 January. Dr. Brain often disagreed with Lord Moran, and this came to a climax when Moran published his controversial diaries. Moran wrote that Brain had “no patter,” which, Moran believed, Churchill resented. The patient, Moran wrote, needed constant reassurance. Brain was incensed by this and sought legal advice. In the event, he contented himself with a rebuttal in The Times (copiously extracted in this article). Lord Moran was not at fault in waiting for so long to call in Brain. Churchill’s recovery had been prompt. Brain himself later agreed that Churchill had rapidly regained his usual self. The authors refer readers to two related articles, one old, one new. 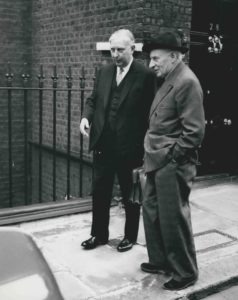 In the Atlantic Advocate, February 1965, Beaverbrook’s associate Michael Wardell published “Churchill’s Dagger: A Memoir of ‘La Capponcina.’” Republishing this piece in 1995, Richard Langworth wrote: “We approach this memoir with some caution. Unless he taped these conversations, which is impossible, Wardell must have had either a photographic memory or a well-filled-out diary. Nonetheless, his account is fascinating, and has the ring of truth.” Also cited is R.W. Griffiths, “Sir Winston Churchill’s Doctors on the Riviera, 1949-1965: Herbert Robert Burnett and Gibson Dafydd Myrddin Roberts,” Journal of Medical Biography, January 2017. Recoveries can be deceptive. On 24 January 1949, twelve days after his return from Monte Carlo, Churchill suffered a relapse. “Everything went misty,” he complained to Moran. This event provoked renewed controversy between Moran and Brain. Churchill’s pain in the shoulders persisted, Moran wrote. So he invited Brain to what he incorrectly described as Brain’s first consultation, on 25 May 1950. On the surface, however, all went smoothly. 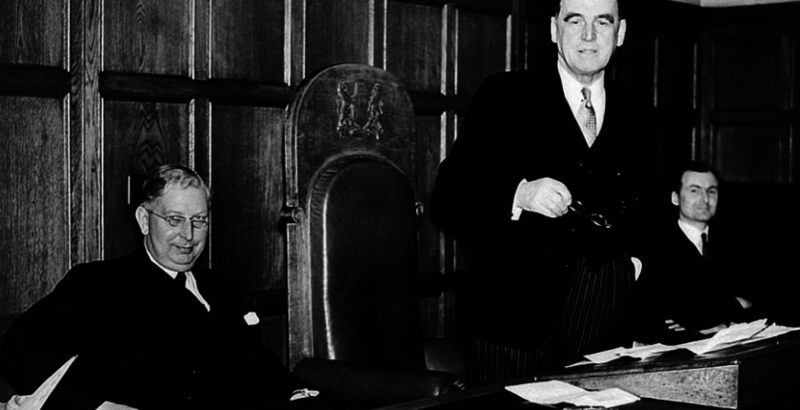 Flattering words were pronounced on all sides in July 1951, when Churchill, Brain and Moran met for the unveiling of Moran’s portrait at the Royal College of Physicians. It is of interest that Moran did not ask Brain to visit Churchill from May 1950 until mid-1953, though Churchill complained of “a muzzy feeling in his head” (11 October 1951) and what Moran called “a small arterial spasm” (21 February 1952). But again Churchill recovered rapidly, dismissing any thought of retiring. So there was no real reason to consult Dr. Brain. This account of Churchill’s stroke in 1953 includes the medical observations of Moran and Brain and those of his family and Churchill’s political colleagues. It is the most comprehensive account of the stroke which threatened to end Churchill’s second premiership, and with it his political career. The stroke followed a hectic two months associated with the Coronation of Queen Elizabeth II, official festivities and functions. Many memoirs and diaries refer to this incident. A fresh character in the story is the cardiologist Sir John Parkinson, who had first assessed Churchill in February 1942. Churchill’s almost day-by-day evolution as a patient, after his stroke on 23 June 1953, was witnessed by numerous individuals. On this episode, Sir Russell Brain continued to denounce what he saw as inaccuracies in Lord Moran’s published diaries, including the dates Brain visited Churchill. It’s unfortunate that Parkinson left no records: we can rely only on Moran’s The Struggle for Survival, and Brain’s published rebuttals, to know what the cardiac specialist concluded. The medical world and Churchill’s entourage agreed that Sir Winston’s recovery after this fateful episode was spectacular. On 18 August, he presided over a cabinet meeting lasting for nearly three hours. Apparently, none of his close colleagues who did not know what had happened could believe he had suffered any new medical problem. The authors strive to identify the exact nature of Churchill’s 1953 stroke, the worst medical crisis in his long career. It consisted of a left hemiparesis (weakness of one side of the body, in his case the left). Several factors could have caused this. From previous articles, we know that Churchill suffered from bilateral cerebrovascular disease. Though it is not possible totally to exclude a small subcortical haemorrhage, the stroke was most likely caused by a small lacunar infarct—in less technical language a small vessel disease. Sir Winston’s remarkable ability to overcome this stroke is likely to be found in his psychological rather than physical constitution. His will and drive to recover—aware that he must capably speak before the Party Conference in October—were impressive. While one can speculate about the influence that may have had, there is no doubt that he bounced back rapidly. In doing so, he confounded the cautious, yet entirely appropriate prognoses, of Doctors Moran and Brain. But that was Winston Churchill.